Check this out! Download this template now and have it ready as a wonderful Christmas gift for your whole family! Download it today from my online store (just click on the image above to go directly there). Alternate working title: Where has Christyne been?? (stick with me...there's a card coming further down). Just before Christmas, I started knitting again. I haven't picked up knitting needles since I was pregnant with my youngest TEN YEARS AGO! While I was pregnant with Jonathan, something removed the ability to read a knitting pattern from my brain. Maybe it was "Mommy-Brain" or "Pregnancy-Brain" or something else altogether. I just knew I couldn't do it! My girlfriend said I should try knitting those popular ruffle scarves because they were REALLY easy. So I gave it a shot and found I could do it - YAY! Not one to stop there (pretty sure I have an addictive personality), I decided that I would try knitting SOCKS!! I figured if I could knit socks, I could pretty much knit anything. Keep in mind that I have NEVER, EVER knit ANYTHING in the round. I'd used circular knitting needles to hold lots of stitches when knitting blankets, but I was still knitting back and forth. I channeled my dear Aunt Margie and went to work. The pair at the top of this post is the first pair I knit. It doesn't have heels, so it was pretty easy to do. Since then...I've been knitting...in the round...ALL. THE. TIME. If it can be knit on circular needles of double-pointed needles, I'm all over it. Socks, hats, cowls...my favourites though, are the socks. I think I've knit about eight pair. I may never buy socks again! Here's the start of a cowl pattern. It's finished now and I LOVE IT!! I haven't been doing much stamping because I can't put down the needles! 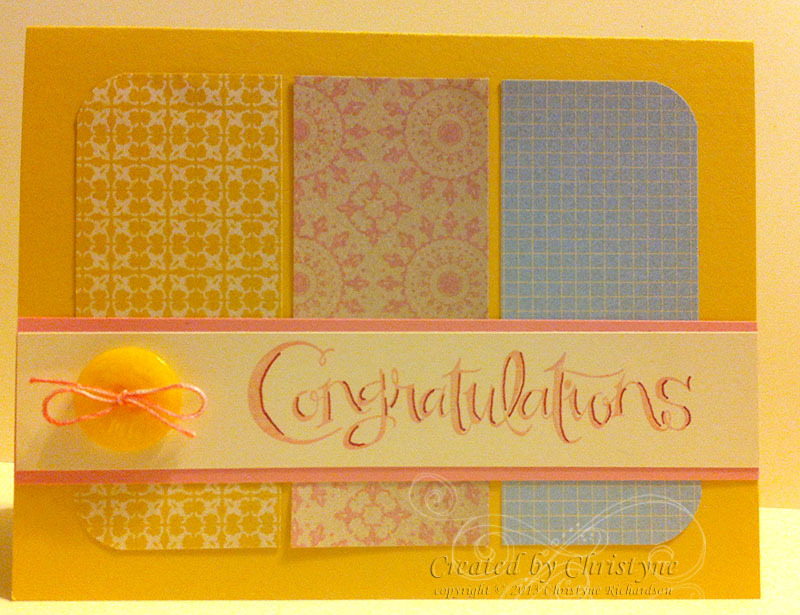 Today is Utah Divas International Colour Challenge day though and I just happened to have a card ready to go! I cheated a bit and used some blue, but that the only "extra" colour. Today's colours were Whisper White (I chose Very Vanilla for my Neutral), Pretty in Pink, Rose Red and So Saffron. 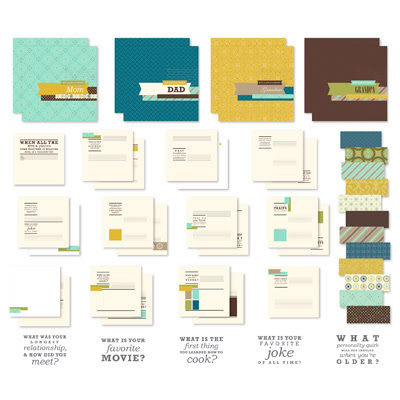 The papers from Tea for Two in the Occasions Catalogue were just a PERFECT match! This card is one we'll be doing in my "Oh, Baby!" class on March 9th, 2013. I still have space left in both the morning AND afternoon classes and I'd LOVE to have you. The class is just $25 and we'll be making at least six cards! Blog around the block with SUDSOL! Welcome!!! You've arrived at the first stop on the SUDSOL blog tour! Today, I'm sharing some new goodies as well as some oldies with you - ENJOY! 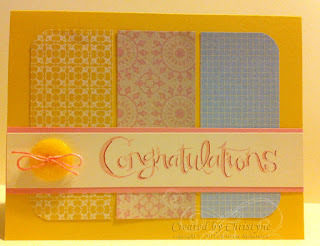 First up is a card I created based on an idea in the new Occasions Catalogue. I liked the idea of a piece of cardstock embossed with the new Honeycomb Folder in the middle of the card, so that was my jumping off point. 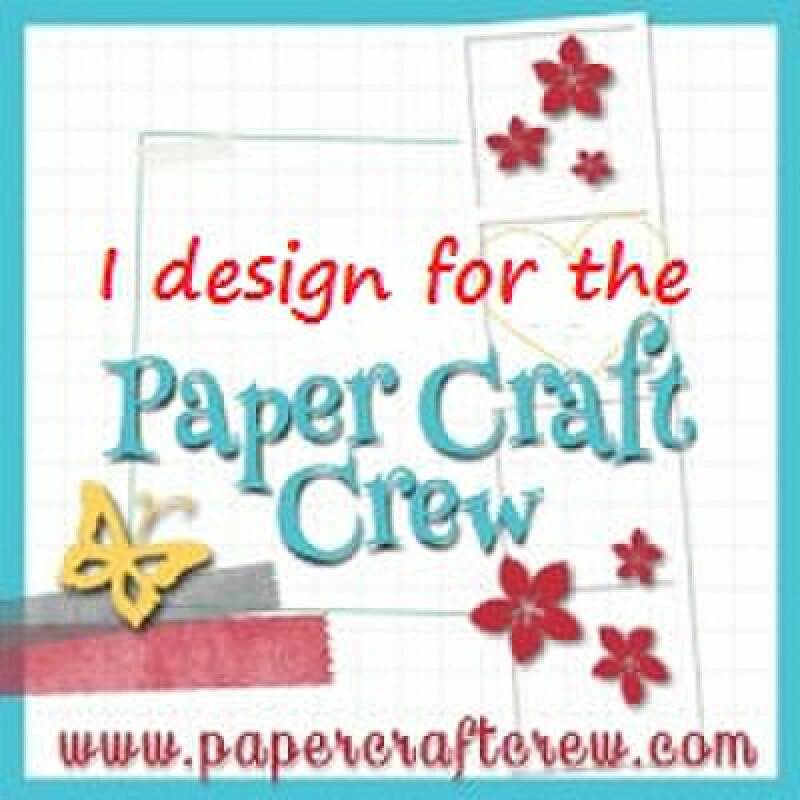 My next step (since this was originally a swap card for a special group of ladies with whom I swap each month), was to figure out which papers in my stash were well stocked - LOL! Hey...you gotta use what you have, right? So, I went with Pretty in Pink because a) I had a lot of it and b) it's one of the colours in the new Tea for Two Designer Series Paper. If you don't already have this new paper you're going to LOVE it when you do get it. It's got lots of pretty subtle colours with a few darker ones to offset those. The Collage Curios set is (so far) one of my favourites from the new Occasions Catalogue. When I saw the teeny, tiny Eiffel Tower, I immediately thought about Artistic Etchings and just knew it would be a cute match. 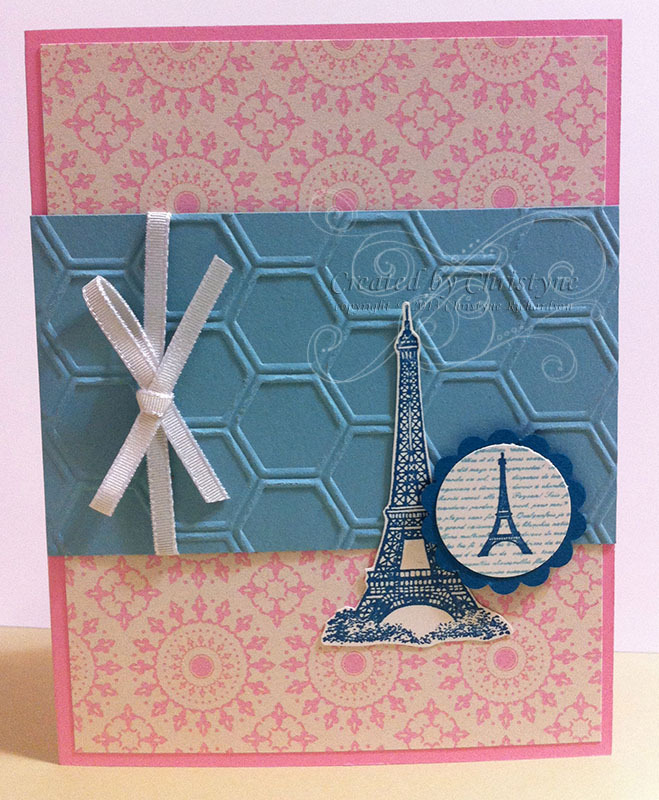 For this image, I stamped the background stamp in Baja Breeze and then using my Stamp-a-majig added the Eiffel Tower in Island Indigo. I then punched it out using my 1" circle punch and matted it on a 1 1/4" scallop circle punched from Island Indigo. If you missed out on the 1 1/4" scalloped circle punch when it was available in the Holiday Catalogue, it's been added to the carry over list and is STILL available (lucky you!). 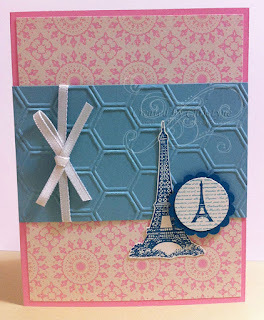 I stamped the large Eiffel Tower from Artistic Etchings in Island Indigo and cut it out before adding it to the front of the card. 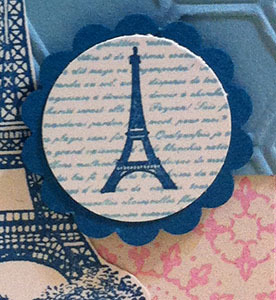 The last step was attaching the tiny Eiffel Tower image with a Stampin' Dimensional. This card was one I swapped at Leadership with the lovely and talented Lyssa Zwolanek. She hosts the most amazing swaps - LOVE THEM! 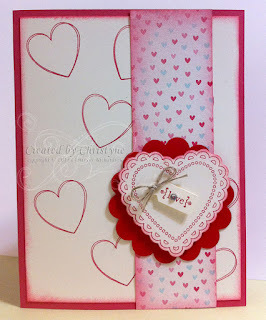 I started off with a base of Primrose Petals (one of the colours in the More Amore Specialty Designer Series Paper pack) and then added a layer of Very Vanilla that I stamped with one of the small hearts from Hearts a Flutter and then sponged using Primrose Petals Ink. I added a strip of the paper from More Amore which was also sponged. 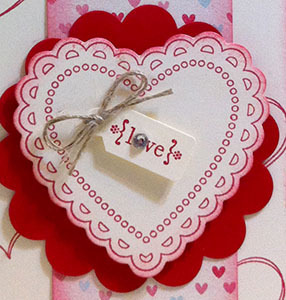 The main image panel consists of a 2 3/8" scalloped circle in Real Red, the large heart from Hearts a Flutter stamped in Primrose Petals and then diet cut using the matching Framelit set of the same name. 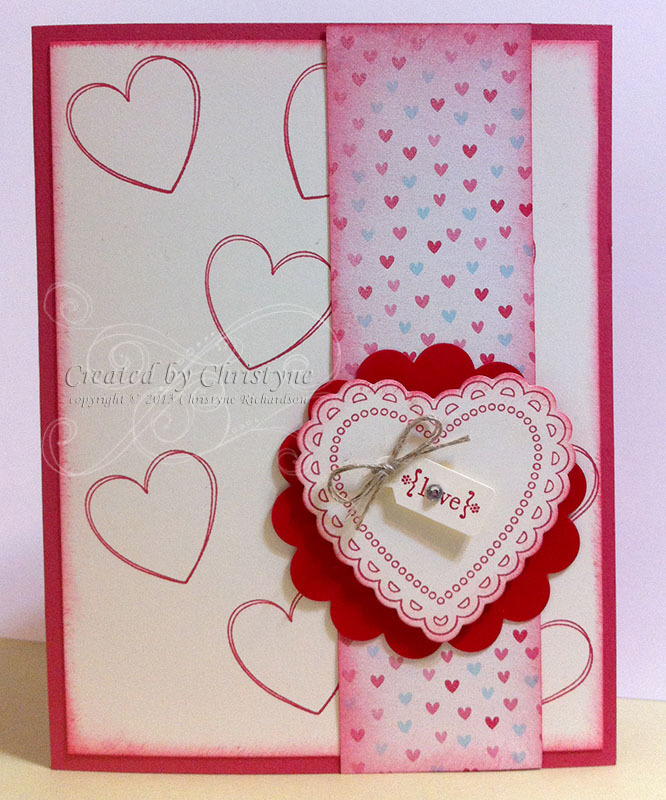 I then stamped and punched the "love" image from Tiny Tags to which I added a teeny, tiny linen thread bow and a rhinestone. I hope you've enjoyed visiting today and that you'll continue on with the blog tour. Next stop is Diana Soling and I just know you're going to see some AWESOME stuff!